Despite the ornery moodiness and general public strangeness of Billy Bob Thornton his breakout film, 'Sling Blade', still lingers as a quiet and haunting masterpiece of Southern American gothic cinema. Billy Bob willed this film into being, first by shooting a short film, then using it as leverage to make the feature version, then covering three of the main roles of writer, director, actor - a solo creative effort which still stands as one of the most uniquely personal stamps in recent film history. Billy Bob Thornton plays Karl Childers who, after 30 years, is recently released from the local mental institution and forced to reintroduce himself into regular society. Karl is mentally slow and has trouble socializing with the Arkansas locals. But he gets a job fixing engines at a local body shop and meets a young kid Frank (Lucas Black), who becomes the older brother and father figure Frank lost years before. When Karl ingratiates himself into the home of his kindly mother, Linda (Natalie Canerday), he's now forced to deal with her abusive boyfriend and monstrous redbeck Doyle (Dwight Yoakam). As Karl’s friendship deepens with Frank he realizes the danger Doyle presents to the safety of he and his mother, forcing him into a heroic act of self sacrifice that will affect everyone’s lives including his own. 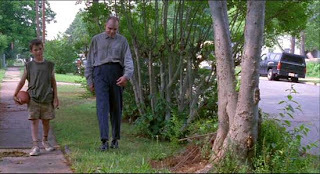 "Sling Blade" essentially plays out like a modern "Of Mice and Men". Billy Bob's guttural voice, forced overbite and lumbering gate visualizes the gentle giant characterization of Steinbeck's seminal Lenny character. Same goes with the threat of violence which blanket's Steinbeck story. A increasing sense of dread accumulates as "Sling Blade" gains momentum and the brief moment of violence which results is quietly disturbing and powerful. Billy Bob sets the story in a peculiar place in rural Arkansas, a world he appears to love and hate. The slow pace and southern charm of the townsfolk is captured with poetic beauty and warm feelings of nostalgic memories, contrasted with the ignorant and lingering racist leanings of the old world. Dwight Yoakam, the foil for Karl, doesn't exist more than as a cancer upon Frank and Linda's lives. It's a base characterization, which is boiled down as pure evil for the purposes of the film's simplistic narrative. The young Lucas Black is marvelous discovery. His sadness as a neglected, fatherless child living in a regressive world with little hope is instantly recognizable to both Karl and us. John Ritter as Vaughn, Linda's homosexual best friend, is played with subtlety. We admire his nobility standing up to Doyle after a drunken fight in Linda’s home. In many ways Vaughn is as much of a hero to the family as Karl is. Without Karl in Frank’s life we assume Vaughn will become the ‘in absentia’ father figure. The other star of the film is Daniel Lanois's pitch perfect dreamlike musical score. Some may know him as a respected producer for Brian Eno, U2, and Bob Dylan, but he leaves a unique stamp on “Sling Blade” - a wave of melancholic southern gothic sounds, sliding guitars and ethereal bible-belt chanting. Other than acting Billy Bob hasn’t had much success since. His second film “All the Pretty Horses” was such a disaster professionally, personally, commercially and for the most part critically. Has anyone seen “Daddy and Them” with Laura Dern ‘released’ in 2001 but actually shot before “All the Pretty Horses”? Enjoy. What does it mean to be "montrous"? Monstrous - typo is corrected. This is one of my all-time favorite movies. I thoroughly enjoyed your beautifully written review. Dude...it's redneck, not redbeck and underbite, not overbite. Hope you pay better attention to detail when making your films.